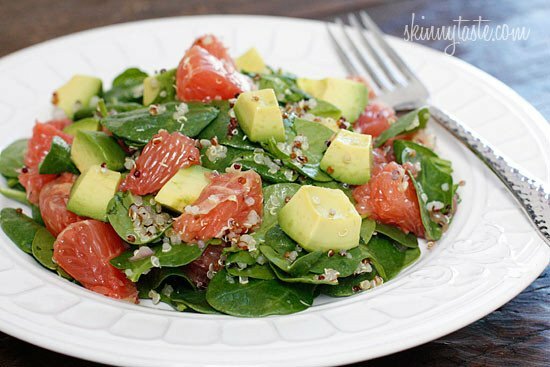 This Quinoa Salad with Spinach Grapefruit and Avocado is loaded with vitamin C, A, Potassium and good heart-healthy fats!! More easy quinoa salad recipes I love are Protein Egg and Quinoa Salad Jars (perfect for on-the-go! ), Quinoa Tabbouleh (from The Skinnytaste Cookbook), and Quinoa Chickpea Avocado Salad. There is something wonderful to me about biting into a salad with grapefruit. It’s juicy and refreshing and lends a sort of bitter-sweetness to each bite. If you are not a fan of grapefruit this is also great with oranges or you could even do a combination. Let’s talk about quinoa pronounced (KEEN-wah). It surprises me how many people have never even heard of quinoa. 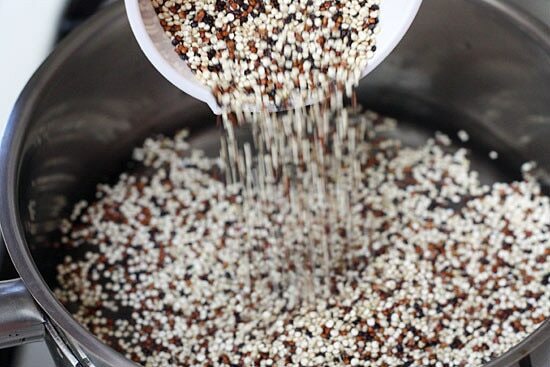 Quinoa is an amino acid-rich (protein) seed from South America with a slight nutty, earthy taste. 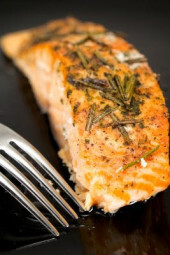 It’s also gluten-free and a great way to add protein to vegetarian diets. I love using it in soups, in place of rice, but it’s also wonderful in salads. It comes in a variety of colors such as orange, pink, red, or black. I found this tri-color variety in Trader Joe’s, use whatever variety you wish. Rinse quinoa well under cold water and cook according to package directions. Peel the skin and white membrane off the grapefruit and separate the pieces. Reserve three grapefruit slices for the vinaigrette and squeeze the juice; set aside. Cut up the remaining grapefruit into small pieces for the salad. In a medium bowl whisk the olive oil, grapefruit juice (from 3 slices of grapefruit), vinegar, chopped shallots, salt and pepper. 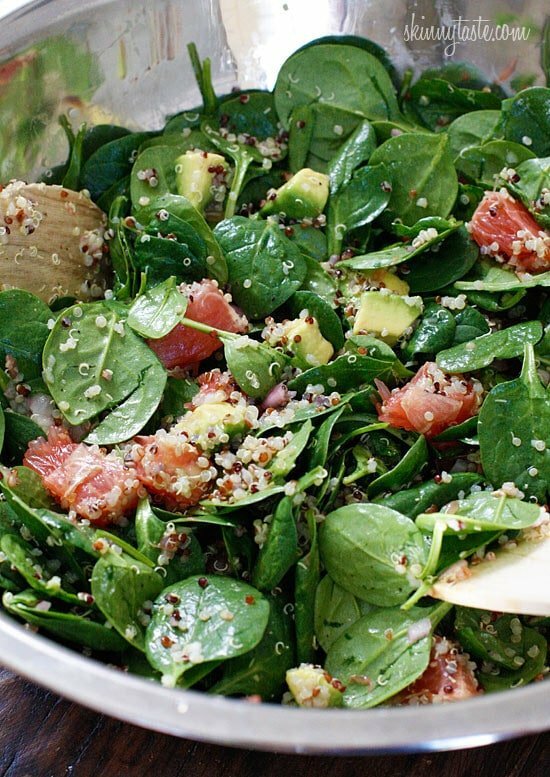 In a large bowl toss spinach, quinoa, avocado, grapefruit and vinaigrette. 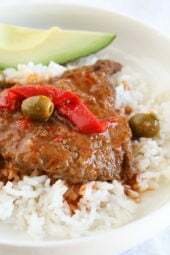 This is a favorite recipe in our house – Love it!!! I sprinkled a bit of feta cheese on top as a garnish, and it was fantastic! Wonderful summer salad! I made this last night and it was so good. I will be making it all summer long. I made this for lunch after yoga today and it was absolutely fantastic. I mixed the champagne vinegar with regular balsamic, though, as white vinegars tend to be too tart for me. I also used black quinoa, it was awesome. Does anyone follow the South Beach Diet? I am in Phase One and am wondering if quinoa is allow on that Phase. It seems like I could eat it since it is a seed and not a grain. Any idea? This was delicious! I've made this a few times now with a few variations, I had to reblog about it, thanks for the great recipe! I'm so glad you all liked it!! This was awesome, I made it for the first time Sunday for Easter, and the bowl was wiped out. I also loved trying two new ingredients the quinoa, and the champagne vinegar. It was so good I made a smaller amount for lunch today. Made this tonight – yummy! Thanks for all the amazing recipes! I made this. We couldn't find the champagne vinegar so I used a grapefruit vinegar that I found at an amazins vinegar store in PA on a trip last summer. I just reduced the juice of grapfruit to squeezing one section. I love quinoa. I discovered it a few years ago at the suggestion of a way to bulk up my protein from my midwife. I have loved it ever since. Even my baby ate it as one of his first table foods. Made this tonight and love it. Next time, I would add shrimp to make it a meal. Im really bad at eyeballing portions….do you know roughly what a serving size is? Thanks!! I made this last night for a dinner I had with friends. Everyone loved it. Great way to enjoy a healthy side salad on a pizza night with friends! Delicious and will totally make it again. This looks yummy! !I love red grapefruit, I find it sweeter than the yellow and the pink and I love spinach! I have to give quinoa another go, tried it a couple of times but came out bitter. Made this tonight for dinner and it was AMAZING! Will make this again for sure. Substituted white wine vinegar for the champaign(couldn't find it in the store) and it turned out good. I'm sure champaign would be better but still i would give it a perfect 10! Made this for lunch today!! Delicious!! So healthy looking…yum!I'm sure this will be good. What a beautiful salad! It looks so colourful and healthy 🙂 I'm pretty sure I'd love it because spinach, quinoa and avocado are three of my favourite things! Gina, another question about the champagne vinegar. I have white balsamic vinegar. Will that work or what do you suggest as alternative? Thanks. Can a vinegar other than champagne vinegar be used; if so, what would you suggest? Sure, use white or apple cider vinegar. Thanks so much for this recipe! All the photos are awesome. I shared it in my latest LIVE YOUR SPARKLE ezine http://tinyurl.com/77ubaxh Hope you don't mind! Sites like yours make healthy living fun! Thank you for all you do. Oh I am so excited for this. I am new to Quinoa and starting a 10 day cleanse that introduces me to wonderful healthy food options like Q… but I had no idea how to add it into healthy foods. THANK YOU! Oooh, that looks yummy. Gonna have to try that one. Always on the lookout for new and delicious salads to try… just because you're trying to lose weight doesn't mean you have to sacrifice on taste! I saw quinoa at Target the other day, but just wasn't sure what to do with it. Thanks for another great recipe. I made this for dinner tonight. I topped it with a little seared tuna that I picked up from Whole Foods. It was absolutely delicious! Oh, and I also added some cod to it that I had leftover from last night's dinner! I guess I forgot to prove I wasn't a robot…Anyway, I tried this today, it was good. I am not a fan of grapefruit, but it wasn't bad. I would recommend to those that don't like grapefruit, use a pummelo, grapefruit like without being as acidic. I would love some recipes using amaranth. Bought after seeing on Dr. Oz. It's good but needs lots of flavor. I just don't know what to do with it?? Love, love your recipes!! Thanks for your hard work. What a great combination of flavors! Love this salad. So wholesome and I bet delicious! To section the grapefruit, I peel it first, then break it in half. Take one half and peel the skin off of one section. Then take the "meat" of the grapefruit out and put in a bowl. Take the skin off of the next section and so on until you have the whole grapfruit in large sections and easy to eat. It is a lot easier to handle than trying to peel each section one at a time. Cannot wait to try this when my daughter comes to visit. She is Vegan and I am always trying to find something new and different to serve when she visits. I think this one will be a hit!!! Love this salad! Might have to make it for lunch! If you have a Wal-Mart close by, check there for quinoa. I know ours carries it. yum! looks absolutely scrumptious! 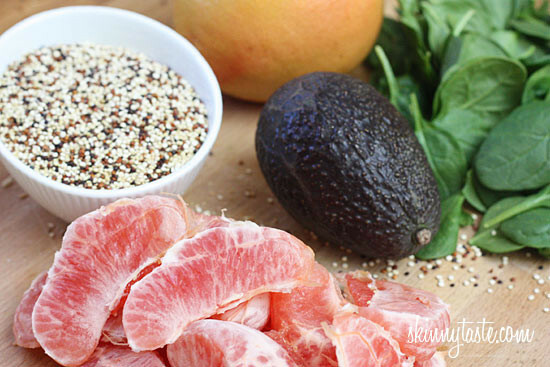 *love* avo + grapefruit together. thanks + have a fab weekend! Can I just say – I have recently had to go on a low-fat diet because I had gallstones. Came across this website last week and the recipes look amazing! Wow. Cannot wait to try some! Thank you! What a wonderful salad! I'm going to tr Quinoa tonight. I'm so curious to use it! I hope I love it!! Have all ingredients on hand except for the champagne vinegar, what might I use in place of it? Really excited to try this. We've enjoyed so many of your recipes! I would try a sherry or white wine vinegar. Looks fabulous and I will for sure make this recipe for a dinner salad. The other grain I have been introduced to late last year is Farro. Started a vegetarian diet last year which took me into new areas of preparing foods, which in turn introduced me to other ingredients I had never heard of, or ever eaten….like quinoa, kale, farro etc. Gina, your website is truly amazing, the photos and easy instructions make it a highly recommended bookmark for all. Thanks for all your hard work, but know it is loved by many! Yes, I love farro too. I need to add some recipes here for farro lovers! 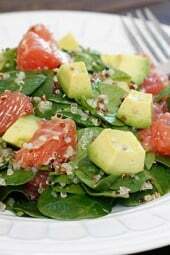 Quinoa, spinach, grapefruit, and avocados? Yum!! That looks so delicious! It's a great combination of flavours. I wouldn't think to add avocado with grapefruit. Awesome idea! Great video; very helpful. Thanks for sharing the link! Great link–thanks! I wouldn't have thought to look that up! thanks for the video! love, love grapefruit. This looks tasty! Thanks for sharing. I love quinoa, but can never seem to find it anywhere. I wish they would put it in the regular grocery store. More people need to eat this healthy amazing food! 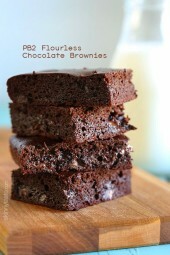 This recipe looks fab! They now sell it in many supermarkets, look again. Mine sells it! Costco has an organic quinoa at a reasonable price! you can get it at Target! Many stores have it in boxed or bulk but are located in different areas of the store so sometimes have to really look around. Comes in regular or gold. Love it in soup. what a gorgeous salad. I often use oranges in savory dishes, but forget about grapefruit. and let's face it: anything with an avocado is a win! Can you use other fruit besides Grapefruit? Not a fan. If you have never tried a Cara Cara Navel, I would highly suggest it! I'm not a fan of grapefruit either but this navel is almost a cross between an orange and grapefruit and is absolutely DELICIOUS! I have been eating them for years and I have yet to have a bad one! I lloovvee quinoa!! I feel like food blogging introduces you to more foods than the average person, though. Anyhoo, this salad looks great! !